Millions of Americans experience discomfort associated with dry eye syndrome. Dry eye is a condition where the tears produced by the eyes lack sufficient moisture and lubrication, which is necessary to maintain good eye health and clear vision. Tears not only wash away dust from the eyes, but also soothe the eyes, provide oxygen and nutrients to the cornea, as well as help defend against eye infections by removing bacteria. Age: As Americans age, eyes naturally become drier. 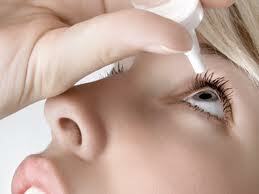 Consequently, the majority of people older than 65 experience some symptoms of dry eye. Gender: Women are more likely to develop dry eye with hormonal changes during pregnancy, while using oral contraceptives and following menopause. Medications: Decongestants, antihistamines and antidepressants are among numerous medications that can reduce tear production. Medical Conditions: Health issues associated with arthritis, diabetes, Sjögren's syndrome and thyroid problems can produce dry eye symptoms. Environment: Dry climates and exposure to wind and smoke may trigger dry eye. It's also important to blink regularly, especially if you work at a computer for long periods of time. Eyewear/Surgery: In some cases, long-term wearing of contact lenses may cause dry eye (or make eyes less comfortable if they are dry), and previous eye surgery, such as LASIK, may lead to a temporary decrease in tear production. Cosmetics: When the lid margin is coated with heavy makeup, it can block the openings of the oily glands, which help lubricate the eye. Treatment for dry eye syndrome varies depending on the severity. Some people can use artificial tears or similar eye drops or ointments that simulate the action of tears, but most will require therapeutic agents prescribed by their optometrist. There are also oral capsules that can help the eyes maintain tear production and guard against future tear loss. Eating fish or taking a nutritional supplement that contains polyunsaturated fatty acids. Increasing humidity in your home and/or office. Blinking more frequently, especially when reading or staring at a computer screen, as well as lowering the screen to at or below eye level. Wearing sunglasses with wraparound frames to reduce exposure to wind and sun. Several new studies have confirmed the correlation between fatty acids and an improvement in dry eye syndrome. Salmon, tuna, herring, mackerel and other cold-water fish are rich in essential fatty acids and can help reduce inflammation, enhance tear production and support the eye's oily outer layer as well as provide health benefits for your cardiovascular, immune and nervous systems. It can come with no warning and no noticeable symptoms. It is the second most common cause of blindness in the United States. "IT" is Glaucoma, the Silent Thief of Sight. While the early stage symptoms may not be noticeable, persons with more advanced Glaucoma may notice blurred vision, the presence of halos around lights, loss of peripheral vision and difficulty focusing on objects. 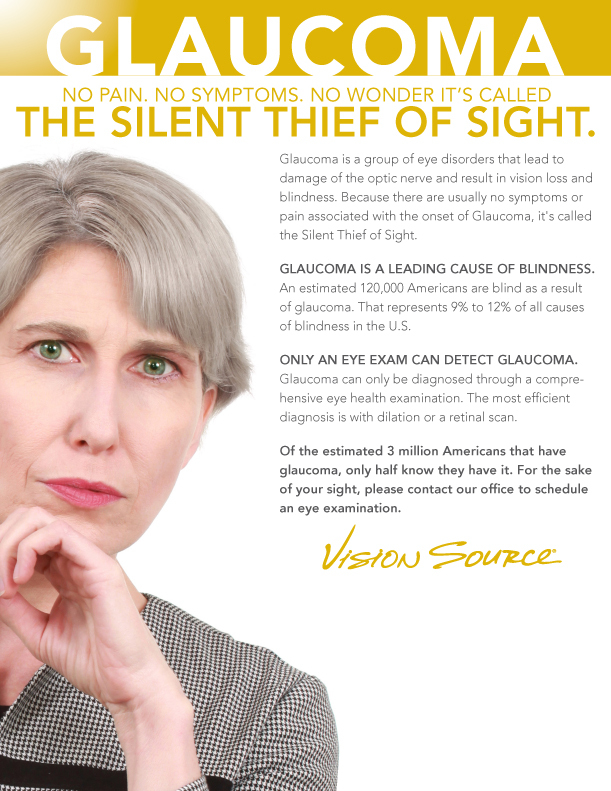 While there is no cure for Glaucoma, early detection and treatment can slow or prevent further vision loss. First and foremost in the process is a comprehensive eye health exam by your family eye doctor.